We're hoping for good weather on Friday (and Hamburg is +9PDT, so at 9pm tonight our time, the crew will be checking the weather at the port.) If so, then the Zeppelin will be loaded onto Combi Dock 1 and depart for the USA. There is a webcam pointed at the Airbus dock that we are using. The link times out and points to a main page, so you'll have to scroll down and look for the camera titled "Nienstedten". This grab was taken at about 1.30am Hamburg time and clearly shows Combi Lift and the Airbus hangar in the background. 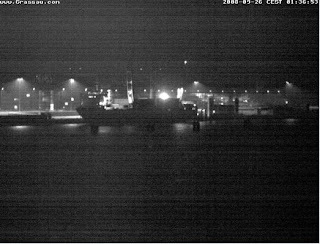 Other webcams on this website are pointed down the river, so once Combi Dock sails, you should also be able to track progress. The airship is carrying the transponder, and we'll let you know where you can go to track the airship once she enters the ocean.